What you don’t see here is the discarded Christmas tree that had been waiting on the verge for the past two trash days. It’s gone because Republic Services picked it up today, the regular trash pickup day in our neighborhood. Why is this mundane fact even worth mentioning? Because in this space on Jan. 5, I wondered if some momentous event, such as a rip in the universe or a ripple in space-time, had disrupted the usually reliable service of the local trash disposal and recycling company, which had advertised it would be picking up trees on trash days during the two weeks after Christmas. When the tree was still there this week, after the second Friday had come and gone, I called the company’s customer service number. A recorded message said they were experiencing exceptionally high call volume, and anyone with questions might want to check the company website, which said trees would be picked up on regular service days Dec.26 through Jan. 9. I got to talk to a person after all. She was in the company’s call center in Chandler, Ariz., and after checking she told me the Christmas tree pickup in Albany would continue until Jan. 19. That was news to a staffer locally, but it appears to be so. In my Jan. 5 commentary, I speculated about weekly yard debris pickup, which would have allowed me to stuff the tree in the cart instead of letting it wait on the road. This produced several comments from readers saying weekly yard debris service, which would entail a price increase, was unnecessary and unwanted. That’s what the Albany City Council said, too, before the two times it turned down Republic’s proposal to that effect. Now Albany is preparing a community survey on a wide variety of subjects. And at the last council work session, Councilman Bill Coburn suggested that the survey include a question about a weekly yard debris schedule. I, am a garage man an I understand what the customer is talking about. Our job is to pickup the trash leaving the customer happy with good service. Good, service an happy customer makes the world a better place. It’s just a tree , the world will not end , eventually they will pick it up. Understand the high demands of a trash company after the holidays , especially after Christmas mister. 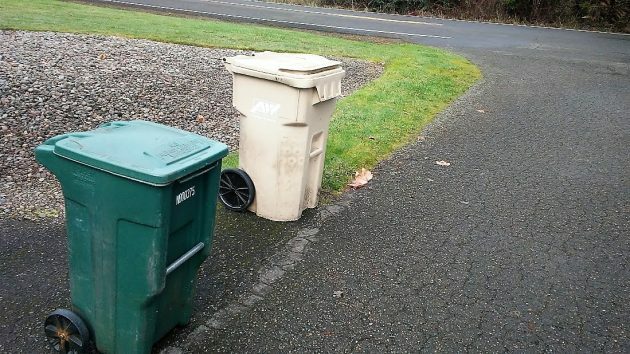 Quick tip cut it in half and stuff it inside your yard waste receptacle aka automated cart, it will be a faster discard and won’t have to deal with that eye sore for weeks.